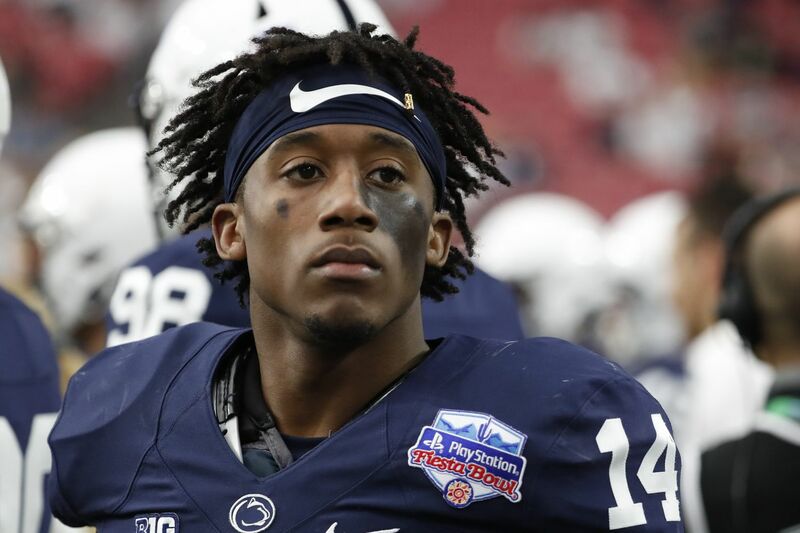 Penn State cornerback Zech McPhearson (14) during last year's Fiesta Bowl. Growing up with six older brothers as Zech McPhearson did, there are few dull moments, especially when everyone in the house played sports. "The competition was very high," MacPhearson, a redshirt sophomore cornerback for Penn State, said Tuesday. "Even to this day, it still is — like my older brothers still argue about who's the fastest, strongest, and all that. But growing up, it was fun. "We did a lot of damage to the house, but my mom wasn't too pleased with that. The competition was very high, and that's one of the reasons why I was so competitive." That sense of competition helped McPhearson stay ready even though he began the season as the Nittany Lions' fifth cornerback. When his opportunity came Saturday night in the rain at Pittsburgh, where starter John Reid sat out with an undisclosed injury, McPhearson was prepared. First, he hauled down Pitt running back Qadree Ollison from behind on a 63-yard run, during a drive that ended with a missed field goal. On the Panthers' next possession, he made the stop for a 3-yard loss on fourth down from the Penn State 4, a play that swung the tide toward the Lions and sparked a 51-6 romp. "Individually, it's big for me, a nice little confidence booster," McPhearson said. "But that's really not what it's about. Worry about the team, helping the team out, stopping Pitt — that play could have given them a lot of momentum in the game. So I was just more concerned about making a play for the defense and giving the offense the ball back." McPhearson, of Columbia, Md., has carried a good spring, which included a fine performance in the Blue-White game, into the new season. He was in on four tackles at Pitt, counting the two big plays. He was schooled well. Five of his six brothers played college football, including Josh, a running back who played at Penn State from 2015 through 2017. Gerrick Jr. was drafted by the New York Giants. Two other brothers played pro baseball, including Matt, who spent this season in the New York Yankees' organization at Class A.
Zech McPhearson, left, exchanging words with Washington quarterback Jake Browning in the Fiesta Bowl last season. McPhearson, who also is a center fielder, said he considered college offers to play baseball and thought about playing both sports at Penn State before settling on football because "it would be tough to be fully applied to school and try to do" both. He and Josh spent two years as teammates. He calls it "the best two years of my life." "Having Josh at Penn State was an awesome experience," he said. "He taught me a lot. He's a very mature guy. I went to him whenever I needed something. He was always there for me, motivated me a lot through this whole process. I give Josh a lot of credit for everything he's done for me, and everything I've done." McPhearson's parents also participated in football. Gerrick McPhearson Sr. played at Boston College and was drafted by the New England Patriots in 1989 before his career ended after three games because of an injury. Kim McPhearson played for a season in the National Women's Football League. MacPhearson also has a younger sister, Kimberly. MacPhearson said the most difficult part of coming from a big family is making sure you blaze your own path. His emergence in Penn State's defensive backfield is part of that process. "That's what I learned growing up," he said. "You've got to focus on yourself. Be thankful for the ones that went ahead of you and the path they laid down, but just keep going at it and build your own legacy."